Turkish Government Crackdown Forces Intellectuals To Flee Thousands of Turkish academics and other intellectuals are leaving the country amid the government's crackdown on dissent. The mass exodus is fueling a growing brain drain in the country. 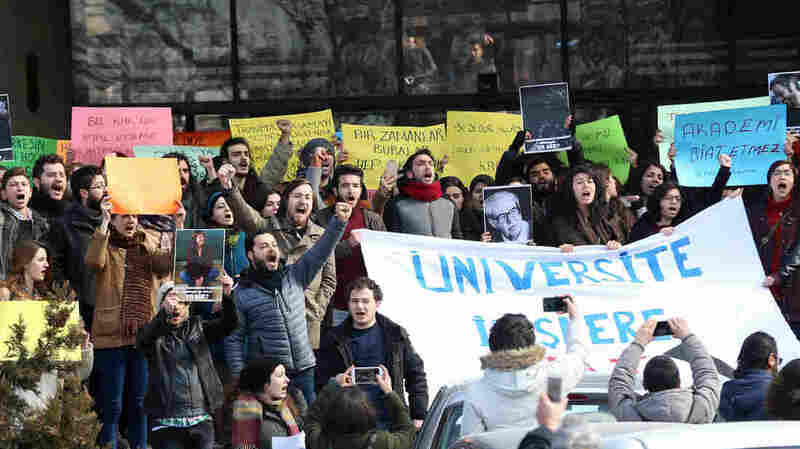 Academics and students shout slogans during a protest against the dismissal of academics from universities following a post-coup emergency decree at the Dil ve Tarih Cografya campus of Ankara University last February. Intellectuals are leaving Turkey in large numbers amid President Recep Tayyip Erdogan's crackdown on dissent after the failed coup attempt against his government in July 2016. In the aftermath of that coup attempt, which led to the deaths of more than 240 people and the subsequent arrest of tens of thousands, the Turkish government also fired more than 100,000 people from their jobs, including civil servants, university professors and soldiers. Many in Turkey's intellectual and professional class who remain are concerned about Erdogan's shifting emphasis on religious nationalism and the future of democracy in the country, BBC Turkey Correspondent Mark Lowen tells Here & Now's Meghna Chakrabarti. "What you're seeing is a steady exodus of those who are opposed to the direction that Turkey is taking," he says. "I suppose in years to come, Turkey could count the cost really of that steady demographic change." While there are no national statistics tracking recent migration, Lowen collected some examples in the course of his reporting to illustrate the mass flight. In the two years since 1,128 Turkish academics signed a petition calling for the government to make peace with Kurdish militants, 698 academics have applied to U.S.-based organization Scholars at Risk to be moved abroad. The U.K. Home Office estimates nearly 17,000 Turkish people moved to Britain in the past five years. In the same period, about 7,000 came to Germany, according to the German Federal Statistical Office, and 5,000 moved to France, according to the French Interior Ministry. Others are buying their way out of Turkey, Lowen says. As many as 430 wealthy Turkish nationals have been granted so-called Golden Visas in Greece by purchasing property in exchange for residency. And there could be even more Turks there than official statistics suggest. "Many are in hiding and don't want to risk revealing themselves by seeking help from the Greek authorities," Antonis Spathis, a human rights lawyer in Thessaloniki, told NPR in December. "Some came to Greece with the intention of going on to other European countries or the U.S., but those pathways are closing." Turks have also taken advantage of similar Golden Visa programs in Spain and Portugal, and over 4,500 Turks of Jewish descent have also applied to those countries for nationality. Turkish academics say they are leaving the country because they don't feel safe in their own classrooms. "They are worried about students recording their lectures and releasing excerpts ... to the pro-government media and labeling them as somehow insulting the president or enemies of the state," Lowen says. "It tells the story of a much greater clampdown on people who challenge the government," that is accounting for this growing brain drain. Lowen says Erdogan still has a large following of supporters who make up the religious, pious sector of the country. "Half the country absolutely supports him. They are behind his reforms to give a voice to the more conservative side of the country, to reform the economy, to expand the middle class," he says. "The secular side — the ones who feel that Turkey has lost its anchoring to Europe and the West and relations with the U.S. — ... they revile him. " Turkey stands to feel the effects of losing so many intellectuals in the coming years, Lowen says. Fethullah Gulen, the Islamic scholar who Erdogan blames for orchestrating the failed coup, told NPR in an interview last July he is struggling to remain optimistic about Turkey's future. Gulen is currently living in exile in Pennsylvania and denies plotting the coup attempt. "It pains me, but I have some hope, I pray for it to be better," he said. "It is a blessed country, a NATO member, and was an E.U. candidate. These were things we wanted — to see progress in the democracy, to see respect for diversity of thought."